I try to theme my outfit to my activities for the day and since I was going to the ICA, I wanted to put something on that was a little edgy but still true to me. 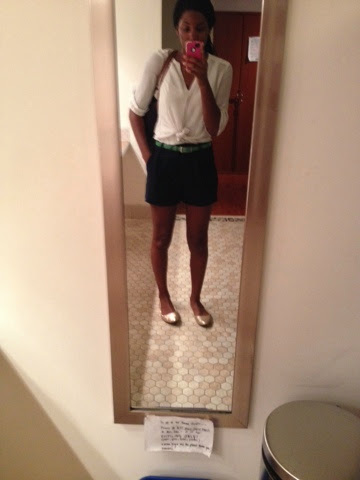 The shorts I have in the picture are perfect for something preppy but a little more contemporary than a chino short. The crepe fabric and the drape lend themselves to something edgy. I also knotted up my blouse to give the outfit a little texture and a little more edge. Finally, the sparkly flats really add a pop to me and make this something more contemporary than preppy. They are from Walmart, rally comfy and the perfect kind of sparkly. Not too shoddy but not too sparse in glitter. Did I mention they were like $12 bucks. SCORE!